Home > Law Books > Treatises > Michigan Administrative Law, 2018 ed. Michigan Administrative Law, 2018 ed. Michigan Administrative Law combines basic information with in-depth analysis, enabling you to prepare your briefs and cases with the utmost efficiency. You'll find specific how-to advice for reviewing and developing your case, along with field-proven practice pointers. 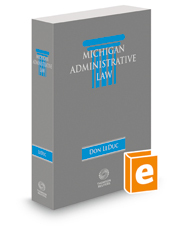 It offers complete coverage of the state and federal constitutional, statutory, judicial, and caselaw precepts that apply to every significant public agency in Michigan. The text also includes licensing rules and regulations, and text of the Freedom of Information Act and Open Meetings Act.